How do you review a review? Do you ever vet the testimonials? 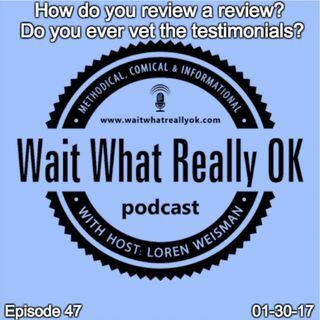 Wait What Really OK Podcast Episode 47 hosted by Brand Precision Marketing Strategist and Counselor, Loren Weisman asks, how do you review a review and for that matter have you ever actually vetted a review or testimonial? From fake accounts to people bashing some while others are overly praising themselves, reviews and testimonials can be that much more deceiving these days. But by taking a few simple steps to vet, ... Más informaciones check and look for certain patterns, you can avoid being fooled and make better decisions on the products or services. Dig a little deeper by reviewing a review and you can find a little more truth in the advertising, praising or the attacking of that reviewer. Podcast Blog Supplement for Episode 47 of the Wait What Really OK Podcast with Loren Weisman. Podcast Link Supplement for Episode 47 of the Wait What Really OK Podcast with Loren Weisman. Podcast Video Supplement for Episode 47 of the Wait What Really OK Podcast with Loren Weisman. Podcast Photo Supplement for Episode 47 of the Wait What Really OK Podcast with Loren Weisman.